It’s pie season! I’m going to post pies back to back! Posts are getting fewer and farther between – and my photography is down right lazy. But what can I do – I rely on this site for all my favorites, and when they’re not here I get a little sad. This pie shared space with the Salty Honey Pie at a dinner party recently. 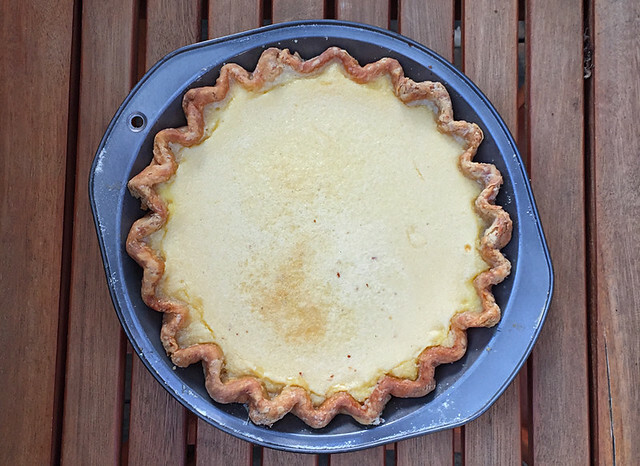 We had a conversation about how “Chess” pie came to be – I’ll let you wiki it and be the judge. Both pies were excellent – or I wouldn’t even bother posting them – Four and Twenty Blackbirds cookbook never ceases to be spot on! mix until filling is thick and light in color – I used a hand held electric wand. Strain mixture through a fine sieve directly into the pie shell. Place on a sheet pan and bake in the middle of the oven for 40-50 minutes. Rotate when the edges start to set (about 30 minutes in). The pie is finished when the edges are set and slightly puffy and the center is no longer liquid, but still wobbly. Do not over bake or the filling can separate.